Oh yeah, then Formula 1 bought in this KERS system and you'd SWEAR it was like Mario Kart. If you were an F1 driver, KERS would feel like a Mushroom giving you a temporary burst of speed. So what if we went one step further? Life imitating art? You never know. Now you too can give this free image a home on your very own desktop. Here they are at whatever resolution suits your computer decor! awesome awesome awesome! my new desktop, great work as you always do. Love this one Nori! I love the choices you made, especially getting your palette to "sit down" a bit. I think it adds to the depth of the piece. Great Job! great distortion of their faces! I really like how you've rendered the atmospheric perspective, really adds depth. Great, cool and makes me laugh. Keep up your awesome work that makes our world happy!! 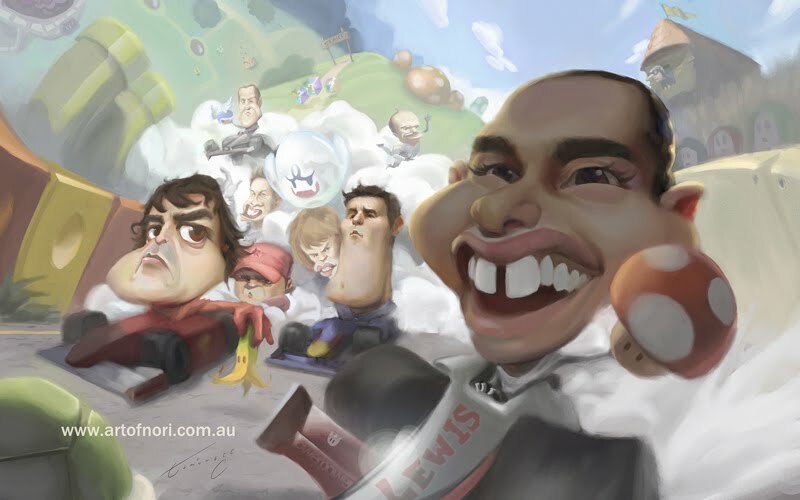 You should relive those days... Mario Kart lives! i love this just as much as i love Mario Kart! great idea, and some good caricatures to boot. Super fun -love the little background details! Nice work Nori , but i don´t like to see lewis win. Take Formula 1 Holidays with your friends.